A country with the largest economy in Europe and fifth in the world, Germany is the nation with the varied types of the landscapes. It has pioneered numerous inventions and is well-known for MBBS in Germany with the option to work while studying. It has a long history of research and Science. Today, Germany has become one of the most preferred destinations for the Indian students interested in going for MBBS in Germany and other courses in the medical sector. The standard of the education in the nation is extremely high. The facilities, infrastructure, climatic condition, internationally accepted course curriculum, and other amenities attract candidates for MBBS in Germany from all over the world. Why not grab the golden opportunity and get your MBBS in Germany enrollment confirmed that can open your door to the endless success in your career. One of the most preferred and sought country online for the MBBS study is none other than Germany. Known for the advanced technologies, it has become one of the powerful countries across the globe. There are a number of the cities that are worth visiting. It is blessed by natural beauty and today it has become one of the favourite tourist spot in the world. It is also recognized as the top country for Study MBBS in Germany by the international students.Germany is a developed country and believes in discoveries, inventions, and continuous growth. The population in the country is over 75 million and is recognised as the most populated country in the European Union. It has achieved all-round growth and development in the various sectors. There are many universities offering the different types of the courses for the local citizens and to the students coming from the different countries of the world to seek admission in MBBS Studies and other professional degree programs. Medicine is one of the fields that keep on expanding. Researchers and Doctors spend their whole lives while trying to find the cure for a disease. What is unique about this field of study is that you will find no start or end to gaining new knowledge. 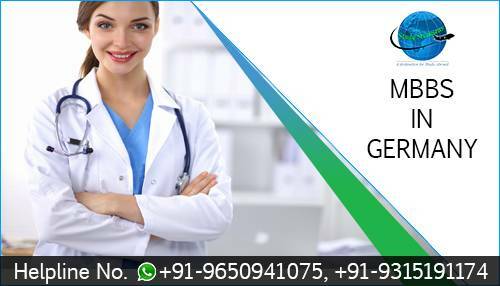 Medicine Program / MD / MBBS in Germany gives a detailed knowledge about several health issues and how to undertake them. The medical course incorporates coverage of public health and promoting health, the influential determinants of health, health education and health communication, philosophy and principles of public health, the hypothesis and theory behind the science and methodology, coverage of epidemiology and statistics and qualitative research techniques. There are over 36 recognised Medical Universities in Germany which has the capacity of 85,000 students approximately. It has been observed that over 9,000 students commence their MBBS and MD studies every year. The percentage of the allotted seats to international students for MBBS in Germany is 5% only which is less than the percentage of the applicants applying for the admission in the different branch of the medical studies in Germany. The last date for the application differs from a university to university. It can also be changed depending on the university decision. But the admission to the various courses closes by July 15 every year. Basic eligibility for MBBS in Germany is 10 + 2 with science as the subject with 60 % and NEET. The duration in Germany is about 6 years. Indian students prefer to choose Germany as their destination to study MBBS. Since the tuition fee for MBBS/MD in Germany is very low when compared to other countries. Top 5 Reasons Why Study Medicine? A candidate gets multiple opportunities for a good careers – He or she can go for the specialisation in (Physiotherapy) (ii) Biomedicine (iii) Dentistry (iv) Veterinary medicine (v) Nutrition (vi) Nursing (vii) Pharmacy, and more. You can help sick and needy people feel happier directly – The happiness that a doctor/medical practitioner gains on treating a sick patient is certainly incomparable. It will help you develop the ability to handle the difficult situations coming in their profession. It not only gives you a good platform to earn a stable and professional career prospect but also help you serve the society as a medical person. Every Medical College in Germany has its own Hospital. Wish to study MBBS in Germany! Students staying in any part of the country can now experience his/her dream of seeking admission in the top medical university in Germany. The process of admission is simple, easy, and free from hassles. The Medical Universities in Germany popular for Study MBBS in Germany are engaged in imparting the advanced and unmatched dental, surgical, medical, and training. There are many universities in Germany recognised by WHO, MCI, and other international medical organisations. The education system is matchless and offer students the training in medicines beyond the expectation. The labs, buildings, auditorium, and infrastructure are hi-tech and together create a highly engaging studying atmosphere. The multiple advantages and favorable climatic conditions attracts more and more students from India every year looking for Study MBBS in Germany based medical colleges endorsed by MCI (Medical Council of India). Students pursuing courses in the different division of medicine can also practice in Germany by fulfilling the eligibility criteria for professionals from international countries. The country has good potential for the clinical practices. The reputed medical colleges in Germany offer various important courses in German as well as English language. Germany is one of the preferred destinations with over hundred approved medical universities and colleges offering 10+ degree programs for international candidates. Moreover, the Tuition fee for Study MBBS in Germany is quiet low in comparison to the other nations in the world facilitating the highly demanding medical studies. The admission process has been made hassle-free and is one of the best countries in Europe for economical MBBS program in Germany. You will also notice that the percentage of Indian students determined for the admission in the MCI approved German Medical Colleges has increased in the last few years. There are many advantages for the MBBS Studies in Germany to the international candidates enrolling for it. There is no doubt that career plays a crucial role in our lives and it all depends on the choice that you’ll make to pursue your studies. It can either make our life or ruin it completely, so selecting the right option at the right time is very crucial. We all want to be successful and happy. And we can only gain happiness by doing what we love. It is just amazing to choose a profession where you can make money and help others too. And you can do that by choosing medical as the mainstream or field of your studies. We all know that such professions are limited and need lot of hard work. As the medical field is one of the most respected professions everywhere in the world. Nothing can be as great as being a doctor. But we all know that it is not so simple as it sounds, to become a doctor you need to do a lot of hard work and efforts. Also, selecting the right place to acquire your knowledge is as important as hard work that you need to do, to become a doctor. The German medical teaching system is praised for being the most prestigious and finest medical educational system in the whole world. The standard of education in German Medical Universities is at level with those in the UK and US. In fact, the colleges that provide medical courses like MBBS in Germany are on the list of top 100 medical colleges across the globe. When it comes to facilities and infrastructure, German medical colleges can vie with top medical study institutes in India like AIIMS. The best part is that learning from these colleges doesn’t tweak the pockets of a student from a middle-class upbringing because the tuition fee charged by German universities is free of cost. Every German medical university has its owned hospitals and other state of the art facilities which are much better than Indian counterparts. Before going into supporting details, let’s first consider the basic requirements that should be met to study medical sciences in Germany. First of all, a degree of Abitur or similar to it is required mainly for the students of foreign countries. Additionally, Also for taking a seat at the universities of Germany one has to appear for a test called Medizinterest that is taken to check the ability of a candidate and to further evaluate the candidate interest and expertise to study human physiology. Besides this, the medical study in Germany is chiefly divided into two parts: Pre-Clinical part in which the learner has to go for a nursing program which is a bit related to the regular internship. This is done primarily to impart a slight experience and practical knowledge about the subject. The second part is about taking of exams and clearing them thoroughly in order to prove their skill in medicine. Germany is lauded as one of the best axes for learning in the world which offer medical programs. Germany offers an excellent education for medical students. The standard of education in the country is very high. It is at level with the global standards of learning in the world. The state-of-the-art infrastructure in the universities can be correlated with the best institutes in the world. The experienced and dedicated teachers and staff ensure that the students ingest accurate skills and education. Germany gives cost-effective education to the overseas students. From second year onwards the students are permitted to work part-time. Germany is a leader in medical equipment and technology. This makes it a favourite stop among the students for pursuing their medical studies. The medical courses offered by the universities are known across the globe. The visa process to study in Germany is quite easy and simple. After working for 5 years, you are also qualified for Permanent Residency in the country. Heidelberg University has an outstanding department for medicine. It trains the students with experience which helps them to face upcoming challenges in their profession with an ease. The university offers an interactive context for advanced learning. Other universities like Lubeck Medical University focuses on technical knowledge and practical training. Social and moral skills are taught to the students. Another university, which is recognized for its dedicated staff and certified expert teachers, is Munster University. It offers 250 programs of study and lays emphasis on research. There is no/ low tuition fee for the medical program in the Universities in Germany. In 2005, a Federal Constitutional Court decision overthrew the traditional taboo on tuition fees. Which means “No tuition fee” is charged from students who want to pursue MBBS in Germany. In Germany education is funded by the Federal Government. The students need to pay a least of Euros 500 for catching expenses like purchasing books and other academic supplies. Though the language training in the country can cost up to Euros 5000. The infrastructure of the colleges is also very nice and they have well-equipped labs for the practical. If students are interested in clinical practice after completing MBBS in Germany then the country offers them wide scope. Minimum 60% in 12th and cleared the first year of Graduation with over 58%. German universities work on the system of 13 years of basic education and so overseas students need to clear 1st year of their graduation studies before applying for MBBS in Germany programs. German Language Skill, should have completed A1, A2, B1 and B2 level. Scores of TOEFL and IELTS are mandatory. A good scholarly record helps the students to get admission in the reputed universities. A valid passport and a declaration of purpose are required during admission process. 10 Photostat copies of 10th, 12th and first year Mark sheet attested by Gazetted Officer. Before you go for studying MBBS in Germany you know about the country and some basic that will help you in getting along with the new country. A great multifariousness of cultures has shaped life in Germany. It is a modern, cosmopolitan country where berlin is the capital. It is a country which is rich in natural beauty. Frankfurt is the centre for global finance. The longest river in the country is The Rhine which runs for 865 kilometres. Germany has the highest population among all other countries in Europe. People of Germany love to praise carnivals in traditional style. Germany was a compilation of 1000 small states and 350 principalities in the middle of 19th century. The country underwent an upsurge in economic output. The German empire was founded when Wilhelm I of Prussia was proclaimed as the German emperor. Industrialization on a large scale took place in the country. In the 1920s loss of territory and political change led to the loss of territory. During World War II, Hitler declared fascism in Germany. Today, Germany is an independent country and is officially known as the Federal Republic of Germany. Germany is the sixth largest country in Europe. Denmark lies to the north of the Germany while Austria and Switzerland lie on the south. The country spans over 137,847 square miles. The population in the country is about eighty-one million. The country includes of sixteen states. The three main rivers in the country are The Rhine, Elbe, and the Danube. Rugen is Germany’s biggest island which is highly forested and includes steep cliffs. For student residences, you will be able to reserve cheap hostel rooms and small apartments. Private shared service is a popular choice among students. Each flat is shared by a number of scholars while the kitchen is shared by all. A flat or an apartment can be the right option if you wish to live on your own and experience a quiet, peaceful environment. Public transport network in Germany is highly advanced. The best ways to travel in the country are by train or cabs. Other public transportation like ferry services is also accessible. Buses run on popular routes at regular time period. Car rental outlets are easy to find and allow you to hire your own vehicle. The railway network in Germany is recognized as the best in Europe. Depending on the distance you plan to cover you can avail benefits of discount on rail tickets. Germany is a land which offers culinary delights. Ancient cooking techniques are used to prepare the several dishes. Popular spices that are used in every German house and every German dishes are mustard, juniper berries, and horseradish. Contemporary German chefs aim at generating new ad light fare which is delectable. Popular dishes of the country include Sauerbraten and Sauerkraut in which roasted beef is cooked in vinegar and wine. And you will surely be going to enjoy the taste of the Germany. Summer in Germany is hot and the winters are cold and snowy. Rain can befall in any season. So it is always essential to be prepared with umbrellas and raincoats. The weather is at its best in autumn and the colour of Germany is worth seeing. When the temperature is warm, it is the best time for outdoor activities. No Entrance Test- In Germany, there is no entrance test to get acceptance in the German medical education program. Duration of Course- The total period of medicine program in Germany is 6 years which includes 5 years of the course plus 1 year of internship. Internship Platform- The internship platform in Germany allows students to earn Euro 40K to 60K which is around 30 lacs approx. Newest Curriculum- German universities maintain their curriculum updated as per latest advancements in the medical field. Practical information- Students who joined the German medical education programs gets more practical exposure rather than cramming the theory. Profession Growth- During the course, the students get industry exposure and get an instant placement after completing it. There is, in fact, a lot of scope for getting a job in Germany itself. Permit to Stay- After completing the degree, Germany allows foreign students to stay in the country and practice for almost 2 years or even move to another European country for studying medicine. Global Recognition- The degree program conferred by German medical universities is recognized throughout the globe. A country of repute, Germany entices students from all across the world every year to take admission in its MBBS course. Just remember one thing before going to Germany for your medical studies. You need to get a good command of the German language. So that it will get easy to interact with the German citizens.